A funny thing happened along the way toward building a STEM school. We knew the curriculum would include elements beyond science and math. Arts, humanities, language, and social sciences are at the heart of both our state’s pre-college requirements and any comprehensive curriculum. What we didn’t expect at the beginning was that study abroad and global learning would become a hallmark of the Gatton Academy of Mathematics and Science in Kentucky. With the US Department of State and US Department of Education’s International Education Week slated for November 14-18, I want to share with you how global learning went from happenstance to a central element of our school’s vision for an atypical high school education. Western Kentucky University, where the Gatton Academy is housed, launched a three-week January winter term in which students could pursue coursework, internships, and other learning opportunities. Because their peers in local high schools would be back in class shortly after the start of a new year, it seemed natural that Academy students would also return to their students at the start of a new year. The Center for Gifted Studies at WKU, with whom we share offices and history, takes middle and high school students to Europe each year. That open period in the calendar afforded us a unique chance to help students learn about the history, language, and culture outside of the context of a classroom setting. In that first year, twenty-eight students traded gray clouds and snowflakes for more hospitable environs throughout Italy. Since that time, winter trips have also included stops in Spain, Portugal, Greece, and France. In 2010, China was added to that list as students participated in the WKU Chinese Flagship Program. Language Flagships are located at universities across the nation. A National Science Foundation grant allowed two students to conduct chemistry research in Taiwan that summer as well. Earlier this year, students conducted plant and wildlife research in the cloud forests of Costa Rice at Cloud Bridge Nature Preserve. This summer, a group of students studied literature in England, with our base of operations located at Harlaxton College in Grantham. Students also returned to China through a Confucius Institute program while others studied in China and Morocco through a National Security Language Initiative for Youth (NSLI-Y) scholarship, which is a competitive program available to all high school students. One student even parlayed her experience in South Africa into a global relief initiative that built a safehouse for women and children who have been abused. 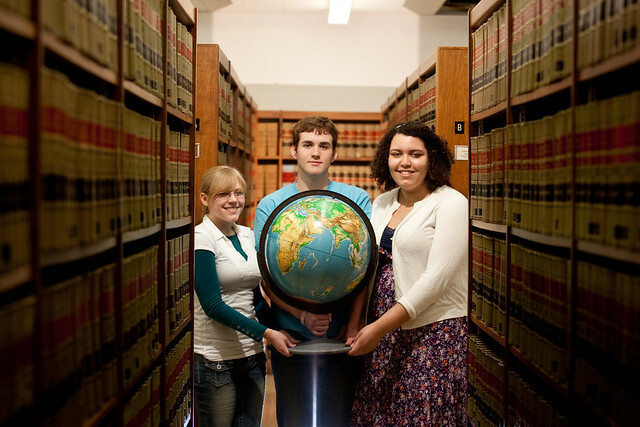 Five years later, over half of the Gatton Academy student body will study abroad this year. By the time the Class of 2012 graduates, seventy-five percent of them will have been abroad at least once through an Academy experience. Why would a STEM school—or any high school for that matter—place such an emphasis on global learning? Books like The World is Flat and China, Inc. remind us that the United States is not the only global power in the twenty-first century. The emergence of industry and technology in Asia, the growing need for a workforce that can communicate with Arabic nations, and continued appreciation of how the humanities shaped the West demonstrate the value of these courses and topics. Moreover, we believe that STEM learning is not an end unto itself. Discussing STEM in concert with language, cultural awareness, entrepreneurship, innovation and art results in students and citizens who possess broader critical reasoning and awareness that open further professional avenues down the road. The ability to place those studies not only in focus but also on the ground and in context causes their influence to resonate more fully with students. In the way that hands-on learning in laboratories connects students to the real-world aspects of STEM concepts, we hope students will immerse themselves in any subject that sparks their interest.